...is yours still in its box? It shouldn`t, and doesn`t need to be. Frame it! 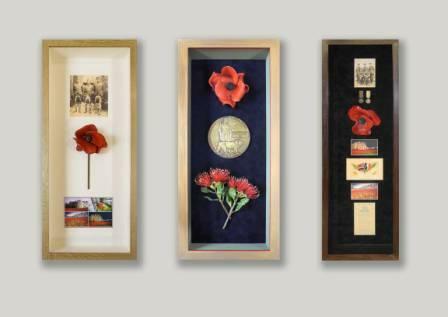 Specialists in framing three dimensional memorabilia we have the creative skills to present your poppy just as you want, whether it`s as a piece of art or as a memory of a relative who served in the armed forces. As significant, is the protection a frame will offer, preventing children and animals from damaging your poppy if left exposed and within reach; and they are not frost proof. We will always discuss creative additions such as photographs of a relevant relative, medals, Great War memorabilia and photographs of The Tower of London installation. The plain oak frame - this moulding with a coat of wax, is sufficiently deep to accomodate the poppy. The stem of the poppy has been cut which looks best when several items are included in a frame. The top image is a copy of a photograph that includes one of the customer`s relatives and the lower image is from the booklet sent out with each poppy and is surrounded by a doulble mount , with a few millimeteres of a red and a white bevel visible. The glass is Tru Vue Museum which provides both excellent clarity and UV protection. The painted frame - includes a synthetic New Zealand pohutukawa, or Christmas flower, which is a symbol of that country and represents the customer`s relative who fought in World War I. The bronze plaque is a commemorative item that was presented to some World War I veterans. The objects are mounted onto blue suedette board. The sides of the box are lined with pale green mountboard. A paint finish has been applied to the frame with the site edge highlighted in red. The plaque is sink mounted into the board, so lies flush with the surface, while the pohutukawa floers are secured with nylon wire. The Poppy is secured with a screw through the middle. Tru Vue Ultra Vue is used. The multi-aperture frame - is one of our own poppies and features a copy of a photograph of my grandfather, along with his medals. The postcard of flags is one of the embroidered cards that couples used to send each other during World War I. We included two images of the installation from the booklet and at the bottom is an old commemorative certificate. The ogjects and images are mounted onto black suedette board and the medals are sewn into position, with wire at the neck of each one. The same frame was used as for the other two examples, but this oak version has been stained brown mahogany. This technique is ideal for viewing the poppy from different sides. The box is made from glass, not acrylic. The frame is a plain wood moulding, which was painted red with a hint of a darker undercolour. The base is a block of wood covered in green fabric, with a hole drilled into it which the poppy fits tightly. The backdrop is changable, this one is enlarged from a photograph taken whilst picking the poppies. 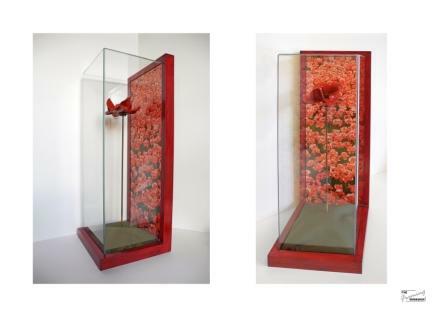 The idea for the design is that the poppy is in the same position as it was when it was part of the installation , looking skywards, which would be hard to achieve in a conventionally shaped frame.